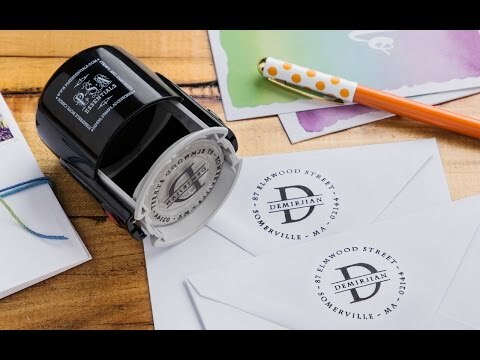 These personalized stationery stamps are just the thing to customize cards, gifts, and crafts, and this self-inking stamper makes it simple. The design delivers a clean, crisp image time after time. When you order one, you’ll receive a blank stamper and a code. Go to PSA Essentials website and use the code to pick out and personalize your design. When your custom stamp arrives in the mail, applying it to the stamper is easy, thanks to its peel and stick design. Dimensions: 3" x 3" x 5"
This stamp is easy to use and not at all messy. Clear and concise. With a personalized stationery stamp, customizing cards, crafts, and scrapbooks is as easy as peel, stick, and stamp. The self-inking stamper from PSA Essentials has a streamlined design that leaves a crisp, clean image with a simple press. To personalize your stamp, use the included code to choose your personalized design online. Once your stamp arrives in the mail, apply it to the stamper—just peel it off and stick it on. Another fun feature is that the stamps are interchangeable. The inner and outer ring can both be removed, so you can mix and match designs, or swap them out for holidays or special occasions. The rings stay sticky even after removing and replacing them many times. And the ink will last through thousands of stamps, too. Whether you’re stamping envelopes or having a crafty moment with party décor, these stamps are so easy, you’ll be coming up with other uses for them, too.